January is the perfect time to be making a heart-warming curry. Brrrr! ! 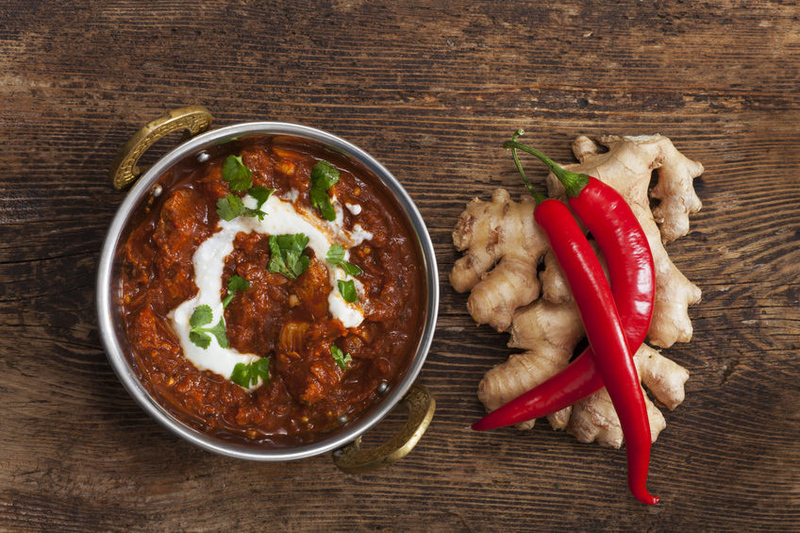 It’s cold outside – the perfect time to be inside concocting a mouth-watering, heart-warming and taste-tinkling curry. You can make this as spicy as you want simply by adding more chili and ginger. Remember to use gloves when chopping fresh chili peppers and do not touch your eyes – they will burn! Wash hands thoroughly after chopping. Likewise, you can adapt the recipe to vegetarian tastes by deleting the chicken and adding tofu or chickpeas. Feel free to vary the recipe by adding vegetables such as zucchini, peppers or cauliflower. If possible make curry ahead to allow flavours to mellow. May be made a day ahead. Cover and refrigerate until ready to re-heat. Trim any fat from the chicken thighs and cut in half to make a bite-sized piece. In a Dutch oven or large saucepan, heat oil over medium-high heat. Brown chicken on all sides. Remove chicken to a plate. Add the chopped onions, garlic, whole cloves, cinnamon sticks, fresh ginger and fresh chili if using. Cook stirring about 2-3 minutes until onions are softened and just beginning to brown. Add the drained tomatoes to the pan; continue cooking 3 – 4 minutes. Stir in the chicken and cook 2 – 3 minutes. Add ground coriander, turmeric and the minimum amount of cayenne pepper if using. Cook a few minutes, add more cayenne if desired. Stir in tomatoes and yogurt. Simmer uncovered about 5 minutes, stirring occasionally. Taste. Add more salt and reserved tomato juice if necessary. Cover; cool and refrigerate until ready to re-heat for serving. Garnish with chopped fresh coriander and mint leaves. This aromatic rice is the perfect accompaniment to a curry. If you wish, delete the nuts and herbs. Wash the rice in several changes of water then place in a bowl; cover with cold water and allow to soak at least 10 minutes. Drain well. In a heavy saucepan bring water to the boil; add rice, bay leaf, cinnamon stick and butter. Bring back to the boil; cover; reduce heat to simmer and simmer 5 – 10 minutes or until all water is absorbed and rice is tender. Meanwhile, toast cashews in a 350 F (180 C) on a parchment lined baking sheet for about 8 minutes or until golden. Stir cashews into rice with coriander and mint. Serve immediately with hot curry. Makes 6 – 8 servings.